A largely disappointing book about the amasser of the Gurlitt art hoard. The trials and tribulations of art appraisal. Walsh argues that despite attempts to change the narrative, Marion True was a curator who knowingly bought looted antiquities for the Getty Museum on multiple occasions. The wooden figurine of a woman was stolen from a storeroom at Sakkara sometime after 2011 and smuggled in to France. The stela was purchased by a UK citizen from ‘an antiquities merchant’. Upon realising it was stolen from a temple in Asyut, he sent it to the Egyptian Embassy in the UK. The individual was seen carrying the historic bell from the Methodist church by members of the public who chased after him. The national museums and monuments director has blamed corrupt curators and law enforcement for the smuggling of Zimbabwean cultural objects. More on the Knoedler fakes fraud trial. The man is accused of breaking the piece on purpose and has a history of mental illness. Eight paintings by Lydia Cash were stolen. I am very interested in this ‘non elite’, ‘everyday’ art theft. A feature on forger Mark Landis and how one of his works entered the Boca Museum. Always odd when that thing you study ends up on the Daily Show, even if Jon Stewart is no longer there. Katie A. Paul, of The Antiquities Coalition, discusses how the Daily Show presented some nuances antiquities trafficking. A reward of up to $5mil for info leading to significant disruption of antiquities looting/smuggling linked to ISIS. I’m guessing ‘core research into effective policy’ doesn’t count for cash? What the State Department has funded with regards to, specifically, Iraq/Syria antiquities trafficking. We’ll see how this goes down: the AAMD doesn’t make the law and “owner” transfer to “Safe Haven” museums may not always be legal. We’ll see. Two were arrested in connection to the theft of these items. The French Concept of ‘National Treasure’ in light of a recent Sotheby’s Paris sale. The story of the Henie Onstad art museum’s return of Nazi-looted paintings to heirs. Imagined Nazi Gold Trains are great for tourism and terrible for heritage preservation. The person is accused of stealing the piece from the church of Asuncion in Montemayor. The Italian man ha been previously convicted for the theft of a painting from Santa Maria della Fava in Venice in 1993. His cause of death is unknown. More on the suspicious death of Sebastiano Maganini. The Victoria Art Gallery in Bath has included fakes in their display and visitors get to hunt for them! Fun! The 23m section of wall fell due to people walking on it;the section itself was a 19th century reconstruction. Director of the State Administration of Cultural Heritage Li Xiaoji called the looting situation in China “severe”. The human cost of the antiquities trade. Three of the five people robbing the tomb near Chengjiao, Yiyang. A 13th century Ganesha was among the items stolen from this site. The museum is returning 114 sacred Indian objects that they received from smuggler Subhash Kapoor. The priest found the lock broken and the stone statues missing. Five were arrested for trying to sell a Quran, but is the book authentic? Either way, they broke the law, but which one? This seems to be a move to get more people in compliance with existing antiquities registration legislation. The crown of Guan Yin deity statue was stolen. A much better question is where do ANY looted antiquities go? Among the stupidest and least helpful things these men could possibly say. The statement was made by the son of Khaled al-Asaad who was killed by ISIS. This is about the items seized from the Abu Sayyaf raid which were later brought to Iraq. 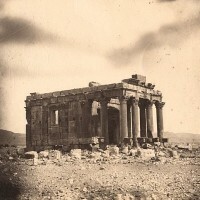 The photographs were taken in 1864 by a French naval officer. Local tourism officials criticise the restoration choices at the Greco-Roman amphitheater in Aspendos. The stone used was not ‘kitchen grade’, rather the correct type of marble. It will eventually age to look similar to the older stone. Graffiti! How naughty of archaeologist Frank Calvert in the 1860s. The Volo Auto Museum offered a $1mil reward for the car Dean died in which disappeared in 1960.